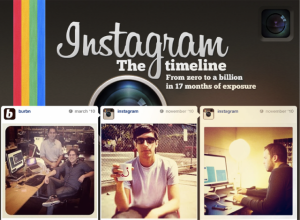 Instagram has been a major hit since day one. This photo sharing app and social networking service is now being used by more than 80 million users and more are discovering the beauty of using it. Its popularity peaked when used by people on Facebook prompting the guys behind Facebook to purchase it at a whopping $1 billion in September 2012. All’s well that ends well indeed. The latest buzz today is that a growing number of marketers are also utilizing this free online tool. In fact, the number of companies using it has gone up in recent years and more are joining the bandwagon. They have recognized the power of photos in reaching out to their target audience. This entry was posted in Marketing, Promotion, Social Networking, Tips and tagged instagram, Marketing, photo sharing, social networking on January 29, 2013 by Teresa Te.